Town of Stellarton is renaming Valley Woods Park to Olympic Park in honour of local athletes. 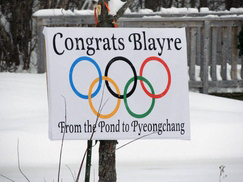 The Town of Stellarton will rename the park in Valley Woods ‘Olympic Park,’ in recognition of two Stellarton natives who reached the pinnacle of their sports: Blayre Turnbull, who won a silver medal with Canada’s women’s hockey team at the Winter Games in South Korea, and 1956 Olympic boxer Babe Mason. Later this year interpretive panels will be placed in the park to honour each individual.